This final issue features an 18-page in-depth interview with Imagineer Tony Baxter and a 24-page detailed exploration of Disneyland's Indiana Jones Adventure. 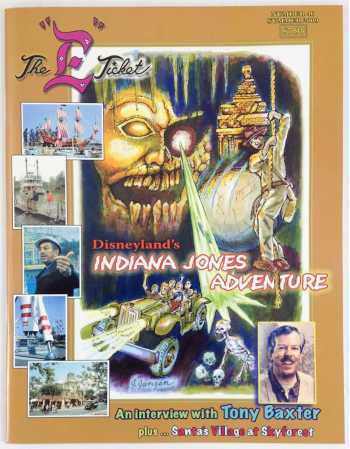 A magazine devoted to "collecting theme park memories," The "E" Ticket--named after the coveted "E ticket" at Disneyland Park that admitted the bearer to the most popular rides and attractions--was started by brothers Leon and Jack Janzen in 1986. The fanzine's intent was to not only provide a detailed history of the brothers' favorite park, but also give readers knowledge about the artists, Imagineers, and other creative individuals responsible for the magic of Disneyland. Each volume features a different ride or attraction, complete with quality stories, in-depth interviews, and never seen before photographs. The "E" Ticket ran for 17 years before the last issue, issue #46, was published in the summer of 2009.